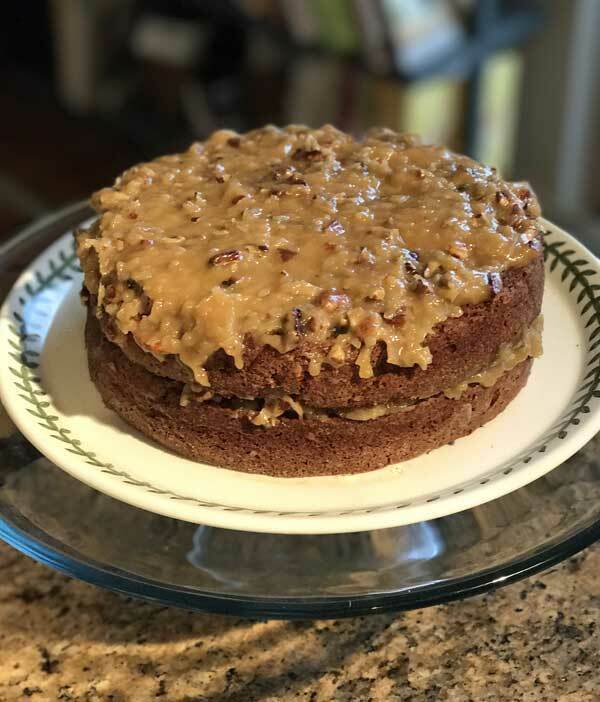 Yesterday Sue and I posted pictures and opinions of a German Chocolate Cake recipe from an old Time Life Series book. We loved the cake, but not its appearance. The icing had melted chocolate in it, which tasted good but made the cake slightly monochromatic. But since the cake was so tasty, I tried making it again a new way. This is a half version of the Time Life recipe (though I did things in a different order), with a non-chocolate coconut-pecan icing. I added a little brown sugar to give it more depth of flavor and I toasted the pecans. The icing recipe as written below makes enough to cover the bottom and top layer. If you want to cover the whole cake, you can double it. Let me know if you make it! I’m really happy to have a smaller German Chocolate recipe since most are 3 layers. Also, if you really like the flavor of GCC and want to simplify things, you could probably make this in a 9 inch square pan. Update: Since posting this I’ve made it several times using two 8 inch round layers. It’s a small cake, but a good size for us. I sometimes cut the cake in half and freeze it for eating later. The slice in the photo above is still partially frozen, but should be thawed out in time for dessert! 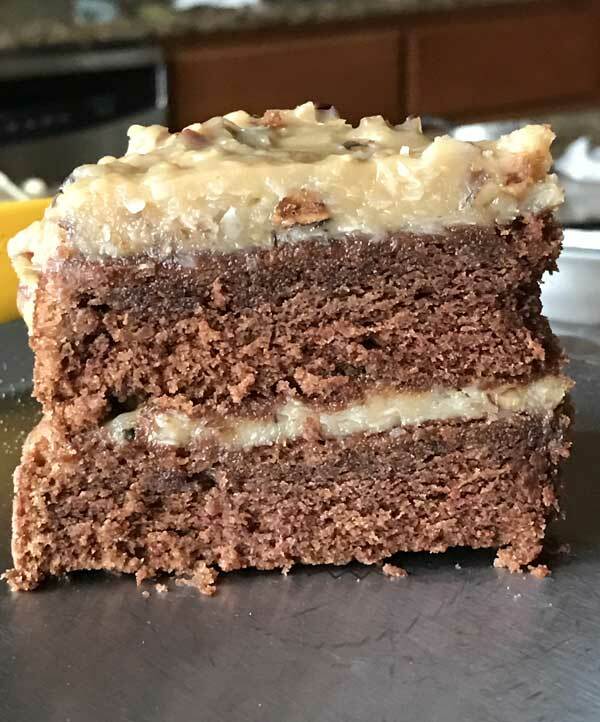 An 8-inch round German Chocolate Cake. Not too big, not too small. Boil the water in a small saucepan or large microwave-safe measuring cup. Remove from heat and add the chocolate. Stir until melted and smooth, then let sit for about 20 minutes to cool. Meanwhile, preheat oven to 350 degrees F.
Grease 2 8 inch round cake pans. Line bottoms with circles of wax paper or parchment, then grease again and dust with flour. Stir together the already-sifted cake flour, baking soda and salt. In bowl of a stand mixer, whip the egg whites until peaks are almost stiff. Beat in 2 tablespoons of the sugar. Scrape the whites into a second bowl while you prepare the batter in the bowl you just used to whip the whites. Cream the butter with the sugar until light and fluffy. Beat in the egg yolks one at a time, followed by the vanilla extract. Beat well and scrape sides of bowl. Turn the mixer to low and beat in the melted chocolate. On lowest speed or by hand, stir the flour mixture and buttermilk into the batter alternately, starting with the flour mixture and ending with the flour mixture. Fold about 1⁄3 cup of the batter into the egg whites, then fold the egg whites into the batter, keeping it as light as possible. Divide the batter between the two cake pans and bake in the middle of the oven for 28-30 minutes; test it with a toothpick a few minutes before. Cool the cakes for about 5 minutes. Turn from pan onto wire rack. Remove parchment and finish cooling. Prepare frosting: Melt the butter in a heavy saucepan. I use one that is 3 quarts. Whisk the sugar and egg yolks together off heat, then add to the butter in saucepan, followed by the evaporated milk. Cook mixture over low to medium low heat, stirring constantly until thick and bubbly (5 to 10 minutes -- for me it always takes 5). Pour this mixture through a strainer into a clean bowl. Stir in the vanilla. Lay a small piece of parchment paper over the top as you would if you were cooling pudding, and let cool at room temperature for about 40 minutes. Stir in the coconut and pecans and transfer to refrigerator to chill and thicken (takes a few hours). To assemble cake, spoon the icing over top and bottom layer and stack. If your icing doesn't seem thick enough, don't worry. It will thicken as it cools. Thanks for testing it! I love getting second opinions on recipes that I scale down or modify, so thanks for the feedback. Next time I make it I will probably put buttercream on the sides too. I made this over the weekend and it came out great! I didn’t even strain the filling, yet it was perfect. Like you, I was seeking a smaller german choc cake, and this really fit the bill! The cake was delish and the filling just like I remember having in other German choc cakes. I made a mocha buttercream to cover the sides, just for appearance’s sake! Thanks again for posting this recipe! I agree, the chocolate in the icing just doesn’t work, visually. This second version looks perfect! Stephanie, I have the Cake Bible and know the trick you are talking about. I’ll definitely give it a try. Thanks! I have a cure for your german chocolate cake icing blues. Make a thin sheet of chocolate to wrap around the cake. It look beautiful & oh so fancy, everyone will be asking you how you did it. 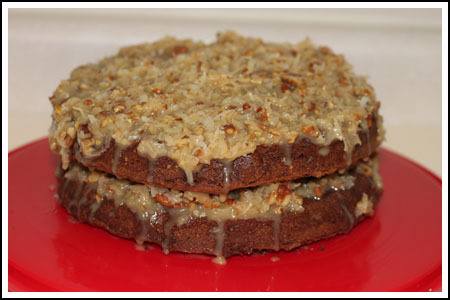 German Chocolate cake is my hubby’s fav & I do this when we have it for his bday. That way, it always looks fancy. Basically, melt any kind of chocolate, pour it onto a sheet of wax paper, cover it with another sheet of wax paper & then lightly roll it with a rolling pin. Once the chocolate begins to harden (do not put it into the fridge or it will be a sheet of glass – that could work as well if you just want to break off pieces & stick on). HOwever, once almost set, peal wax paper off, cut it to desired height & lightly mold it around the cake. YOu can use a hair dryer to reheat parts if you want it to bend. For complete directions, it is in the Rose Berrenbaum “the Cake bible” cookbook. I cannot remember which cake she does it for, but the theory is the same. It is supper easy & look extravagant! This cake is much more attractive! I like the little drizzles of icing on the side of the cake too. Very pretty! Barbara, I know what you mean. The original is great, but I still feel compelled to try different versions. This one is similar to the original but a little less sweet and with more chocolate. I have been trying to find recipes that are still similar to the original, but with little modificiations. Some of the recipes out there aren’t similar to the real thing at all, but rather chocolate cakes with coconut icing. 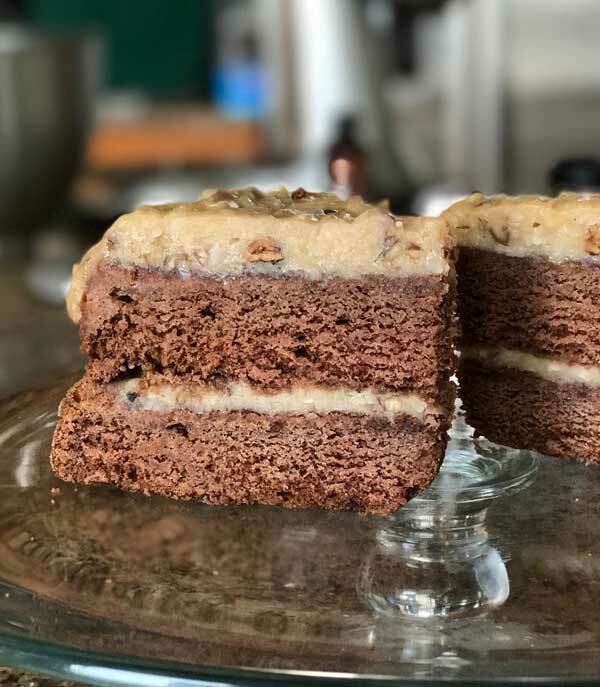 My mother passed on the original German Chocolate Cake recipe to me. And my family loves it so much, I wouldn’t ever try another version. Why mess with a good thing? And of course, it’s still my grown son’s choice for a birthday cake so I always hang in there with 3 layers…serves a lot of people. Boring of me, I know.